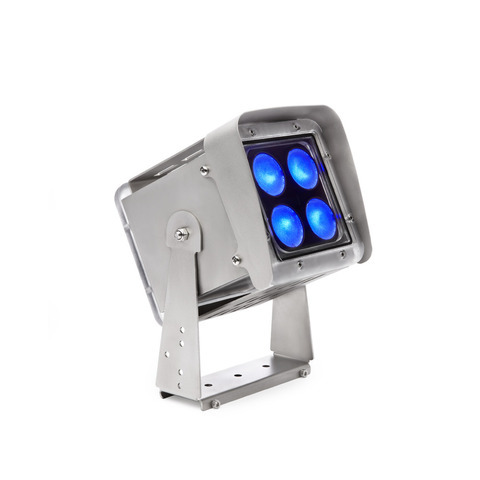 The Exterior 100 IP68™ is an exceptionally rugged and compact lighting fixture designed for extreme outdoor and underwater environments, such as fountains, pools, building facades, landscaping, cruise ships - you name it. Ideal for applications requiring superb color mixing (RGBW) or high quality white light (cold, neutral or warm). Typical Power and CurrentCalibrated RGB mode, RGBW Luminaire: 12 W, 0.4 A at 30 VDCUncalibrated RGBW mode, RGBW Luminaire: 18 W, 0.6 A at 30 VDCCalibrated mode, white (CW, NW or WW) Luminaire: 17 W, 0.6 A at 30 VDCUncalibrated mode, white (CW, NW or WW) Luminaire: 18 W, 0.6 A at 30 VDCMeasurements made at nominal voltage with all LEDs at full intensity. Allow for a deviation of +/- 10%.